I have to write this down, because I have edited another recipe and if I don`t write it down I won`t remember and my family will get mad at me. Ok rolls are finished now I can tell you what I did! Ok here is the back story. I really enjoy watching Pioneer Woman on The Food Network. Last week she made her version of these rolls. I decided I was going to make those rolls for Thanksgiving Dinner. Well her version calls for 9 cups of flour! I only was feeding 5 people, so I thought 36 rolls was a little much. I divided the recipe in 4ths. When I followed her recipe divided in 4ths I ended up with very dense dough. I knew that would not work for gluten free, so I made another batch and altered it to be a better gluten free dough. A gluten free bread dough needs to be A LOT wetter than normal dough. I increased the liquid and changed how everything was mixed together. Here is what I did! butter to generously coat the muffin pan. Plus 2 tbls of melted butter to top the rolls before they bake and again when they come out of the oven. Take the milk, oil and sugar and warm on the stove top. Do not boil! Once it’s warm turn off the heat and let it cool till you can stick your finger in it. I know that is not a technical way to tell temperature, but it’s how I cook. While the liquids are cooling, mix all the dry ingredients together in a different bowl, except the last 1/4 cup of flour. Now that the liquid is warm, but not hot, pour the liquid into a dutch oven, or a container with a lid. I use the dutch oven because it keeps the dough warmer longer. Slowly add the dry ingredients to the wet. It will be very sticky and wet! This is a good thing. Put the lid on it and leave it for an hour or so, you want it to double in size. While that is doubling, you can butter your muffin pan and get your 1/4 cup flour. Ok I know that does not take an hour, drink a cup of coffee and check you email too! Once your dough has doubled add the remaining 1/4 cup of flour. Mix just until the flour in incorporated. Do not over mix. Wet your hands and form a small ball, about the size of a small bouncy ball. Put three small balls in each muffin cup. Now set aside and let rise for several hours. I put mine on the top of the oven while my turkey cooked. The rolls doubled in size. Now that they are big and puffy, brush the rolls with melted butter and put in a 400 degree oven for 15-20 mins until they are golden brown. I brush them with butter again when I remove them from the oven, melted butter has no calories! Serve warm with more butter! They are soft and wonderful. I will edit the post and add pictures, but there was so much going on when I was cooking on Thanksgiving that I could not think about taking pictures. Enjoy, let me know how it works for you. Our Thanksgiving Day is coming to an end and I wanted to wish everyone a Happy Thanksgiving. This year I have so much to be thankful for that I will not take this whole post to talk about my many blessings. I am going to talk about something that makes my family different. As the day comes to a close I listen to the sounds of my kitchen and I get a strange filling that not many of my peers are doing what we are doing right now. My brother for example I know is watching a football game, I believe some of my family is already asleep or playing a card game. We however are canning turkey stock and dehydrating apples! I know many people would call us weird and I guess I am to the point that I almost expect it. We buy our wonderful turkey from a local farmer. I know a lot of hard work goes into raising that bird. Our turkey was raised in an open field where it got to enjoy grass as well as sun light. I can tell you the name of the person who raised my turkey and I can tell you the name of the person who processed it. They valued that turkeys life and so do I! I wanted to make sure that I did not let an ounce of that turkey go to waste. After we picked the left over meat off for sandwiches and meals for the week, I put what is left in the crock pot and covered it with water. I let it cook on HIGH for about 6 hours until I had a beautiful golden stock. I pulled off 3 quarts of liquid, filtered it to get the large chunks out and separated the fat from the stock. We sealed the jars and canned them in a pressure canner. I then refilled the crock pot to repeat the process in the morning. I will continue to do this until I notice the liquid is losing it`s color. In the past I have done it four times at least. This will give me 12 quarts of turkey stock, which I will use just like chicken stock when I cook. 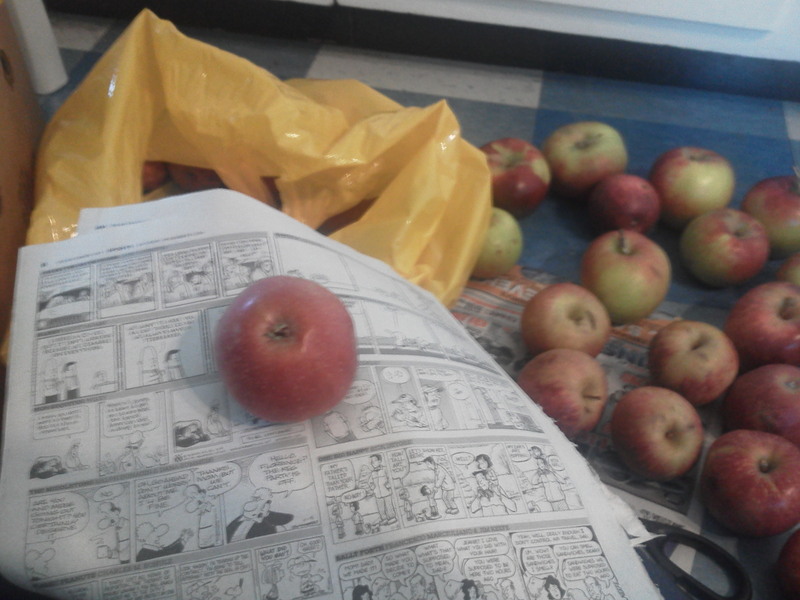 I processed some apple ring earlier in the week and I set some apples aside for pie and for apple sauce. My family has decided that this year they want me to make all the apples into apple rings. So now that Thanksgiving is over and I know I had enough apples for my pies, I am processing the rest of those apples. My dehydrator can do about 30 apples a day so I hope that I will be done by the weekend. To make apple rings is really easy, I core and slice the apples into rings, soak them in a lemon juice bath, (which is about 1 cup juice to 1 quart water). Lastly, I set them on the trays of the dehydrator and let it works its magic. It takes about 8 hours a batch. Store in a gallon bag and repeat the process over again. My family loves them. I hope that you find your bellies full of local food and your hearts are overflowing with the blessings you have been given. Enjoy the rest of your evening and if you haven`t thrown away those bones, I challenge you to make some turkey stock too! We have a few apple trees on the farm, and as much as I would love to tell you have we get a couple of bushel from them a year, I can`t. Our trees were here when we moved in and I do not think they have ever been pruned. They are a mess to say the least. I hope to eventually replace them, but I figured I would use these apple trees to learn on and make as many mistakes as possible, to produce the best apples in the future. Since we can not get apples from our farm, we have a local farm that we support that grows the best apples I have ever tasted. I am trying to convince them to let me come watch them and learn all their secrets. Anyway, their apples are amazing. This year we bought a total of 8 bushels through out the season from them. Most of those are just for eating, with maybe one bushel for pies, sauce and apple rings. One thing we really want to learn how to do it winter apples so that we can have local apples all winter. I spoke to my apple farmer friend and she recommend we try Black Twig apples. 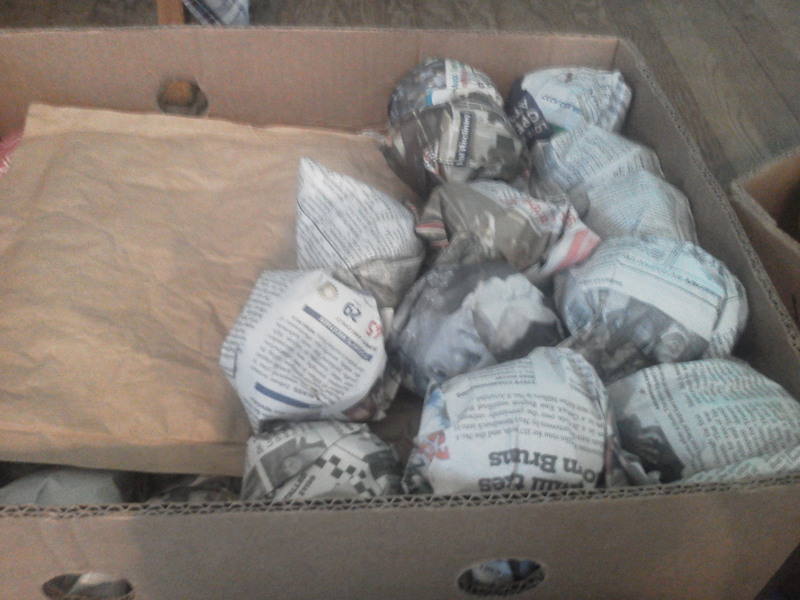 We have bought a bushel, wrapped each apple in newspaper and are storing them in an uninsulated garage. We also wrapped up some Stayman, Granny Smith and Fuji. I know the Fuji and Granny do not last as long as the Black Twig so we will make sure to use them first. We have tried to store apples in the past and we have not been able to make it past Christmas. The apples start to go bad and we have to make sauce. But we always kept them in the basement and have never wrapped them before. We will see how it goes. We are making apple rings and I love how it fills our house with the smell of apples. The problem with apple rings is my kids eat them so fast I can not get enough made to store for later. I am going to try and do a half bushel in apple rings. I have a little less than a bushel of apples that I did not feel comfortable putting in the garage. These apples either had a nick in them or a soft spot. 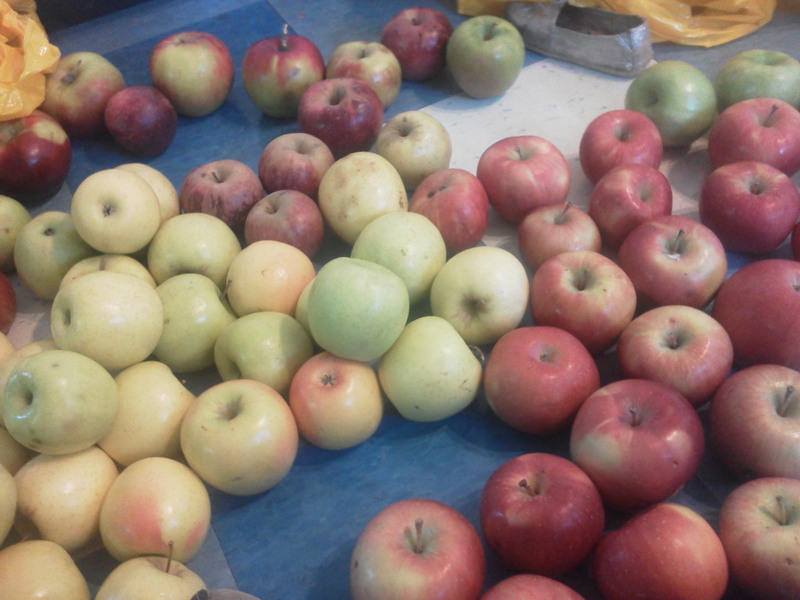 I also have some golden delicious apples and I know those will not keep so I will make those into apple rings or sauce. I love taking pictures of apples, I just think they are so pretty. This is a simple picture but I love all the different color apples together. Let me know how you store your apples, I would love some suggestions. Well we feel like failures, the cold weather came on so quick and we were just not prepared for it. Most of the beds that we put row covers on were killed by frost. We lost our beets, snow peas, cabbage and some broccoli. It looks like we were able to save most of the purple broccoli for spring, the carrots, the head lettuce and the turnips. The other major hit was to the green house. Prior to this hard frost we had tomatoes in the green house that grew up one wall, over the roof and down the other side. These tomatoes were growing great!! The cold however, killed most of them. There are still a few plants that were in the center of the beds, not touching any of the walls of the green house that seem to be OK, time will tell if they make it or not. We lost a chicken this week. I am not sure if it was because of the drastic change in weather or if it was just a tired chicken. This chicken produced monster eggs and even though we loved her eggs, we knew that was a sign that something was not right. 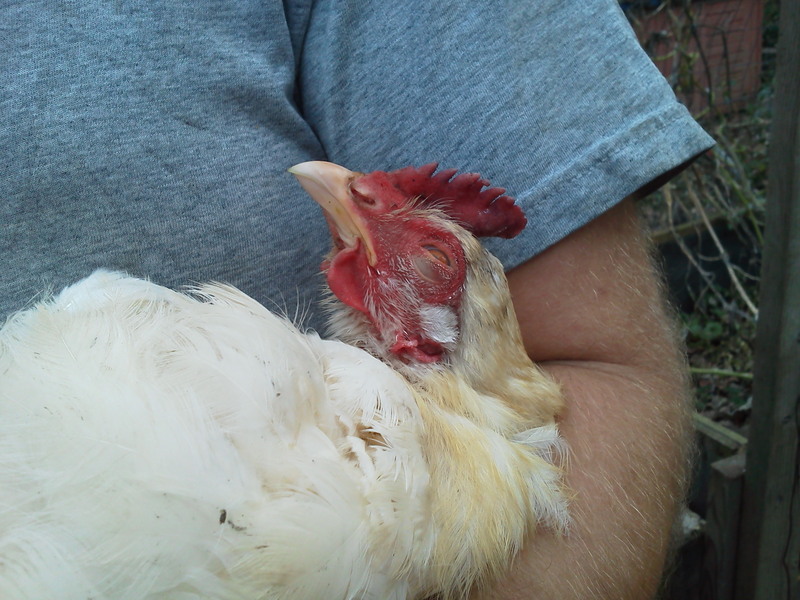 We hope that she had a good life and we are thankful for the eggs that she gave us. She was very sweet and liked to be held. This is a picture of her last week, she died on Monday. The rabbits seemed to do OK with the cold. Last spring we insulated most of the Bunnie Barn. There is still one wall to do behind the Does cages, and my husband hopes to get that done this week. There just never seems to be enough time in the day. The insulation that is in the Barn helped to keep it warm and none of the waterers froze this week. We still have one rabbit in a hutch in the garden. Her waterer froze and we are hoping to sell another one of the does this week to make room for her in the Barn. She has 4 babies that are growing well and were able to keep warm in the nest this week. Other than loosing the tomatoes the greenhouse seemed to do OK this week. The water temperature dropped to 11 degrees Celsius (51.9 degrees F.). We do need to add water, but the fish are still doing great and we have not had any of these goldfish go belly up. We are completely perplexed. The tilapia were dropping like flies in this system and the goldfish are doing great! Blows my mind. The tilapia and cat fish are still doing well in our dinning room, but eventually it would be nice to get them outside where they belong. If we are going to have as harsh of a winter as they say we will, it might be best to leave them indoors until we get the hot water heater in place. Thanks for reading my Sunday Summary, my tea is done so I am going to go. Keep warm! -Our friend the Polar Vortex is back. It has brought an early winter to the mid-west and this week it is heading to the east coast. Today as I write this it is 60 degrees outside, we know that this is not going to last long. We have spent the last couple days trying to get the garden ready for the harsh freeze that is expected at the end of the week. Currently, we have beets, cabbage, snow peas, turnips, lettuce, and broccoli in the ground. These veggies can tolerate cold temperatures but not the extreme colds and the frosts that are expected this week. This is honestly our first year of trying to grow through the winter. Normally, the only thing that we have in the ground is garlic and maybe onions. We have tried to cover our raised beds in the past but we have found that heavy rains and snow would cause them to collapse. This year we have tried a couple different types of row covers to see if we can find a system that works better. The first is shaped like a tent and we have the plastic attached to a middle board and hanging down the sides. It can be accessed from either side. 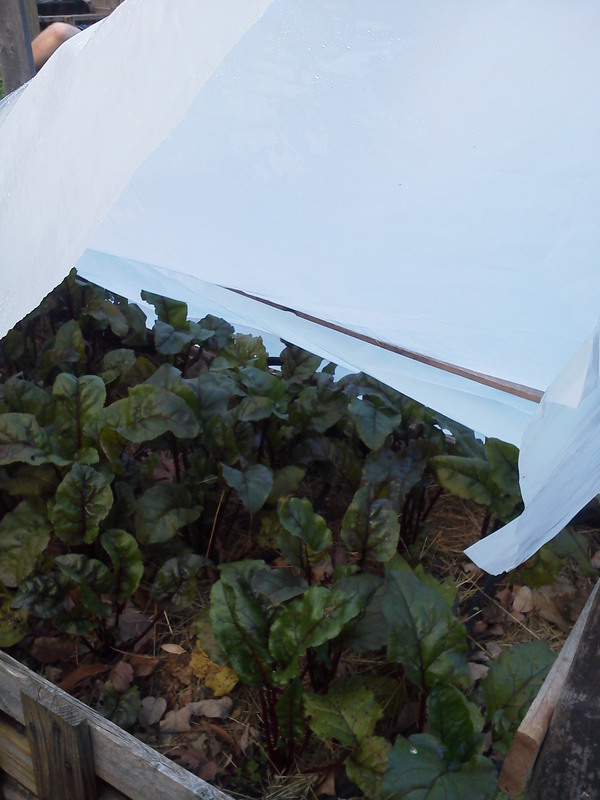 There are beets in this one, so we are mainly just trying to keep the snow and the hard frost off of the leaves. Beets like the cooler temps and I think that it actually makes them sweeter. We have a similar cover over the turnips and the lettuce, however I know that they need to be kept a little warmer than beets. The second thing that we did was a thicker piece of plastic at an angle, this is over the broccoli and the carrots. We also put this over an open bed and I am hoping to plant a batch of lettuce and spinach in that but I am not sure if it will germinate in the cold. I feel like everything we do is an experiment. We also have two beds that are under recycled windows. 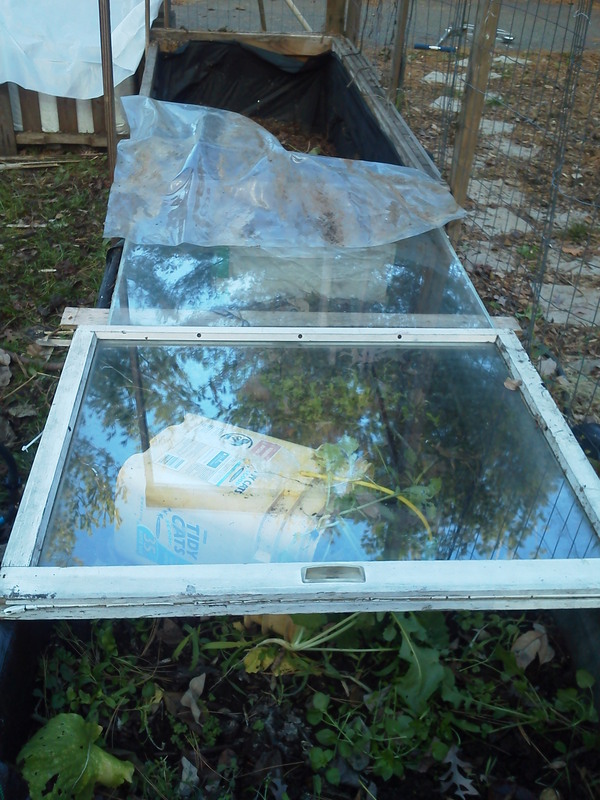 This has been our most successful way of covering the beds in the past, but it is hard to lift them up without the snow falling in on the plants and I am always worried that the glass is going to break. But when we have used them in the spring to get an early start for the tomatoes, these always work the best! 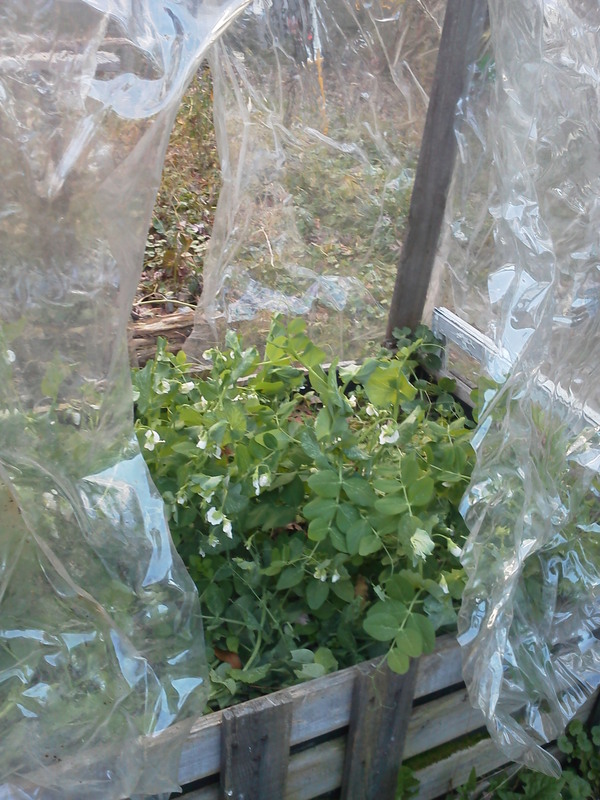 Last, we put our large plastic cover back on our bed of snow peas. This is the cover that has had the largest problem with the snow in the past. 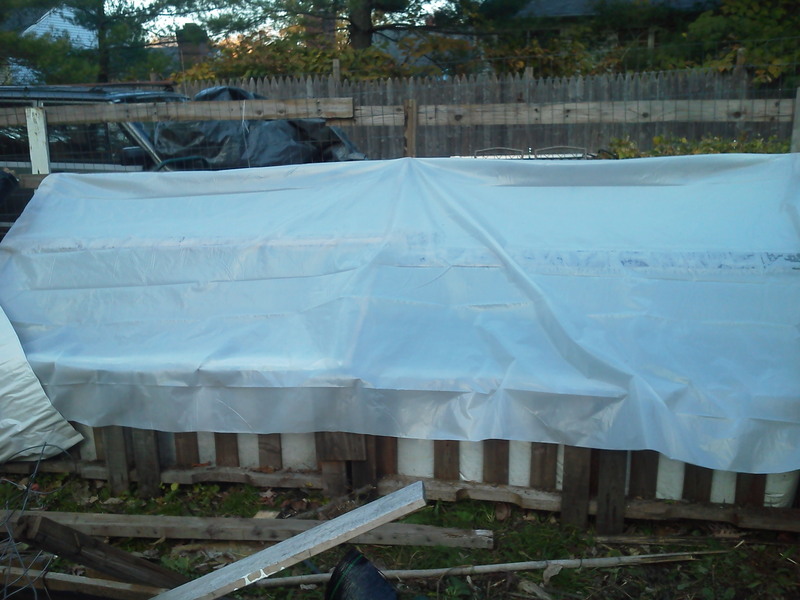 For this cover I sowed pieces of vinyl together to make a slip cover for the raised beds. We have tried this in the past to see if we can extend the tomato season and we needed something that was really tall. In the past, it has collapsed under the weight of rain and snow. This year we have put it on a bed that has more cross support pieces, I am hoping in the next week or so I can harvest these snow peas and pull up the plants, so it will not be exposed to much snow. The problem is the kids are eating them before i can get them into the house. I guess next year I have to figure out how to plant more snow peas next year. Right now we are still very much going through a learning process. But I was once told my a good friend and mentor that the day you stop learning is the day you find a new job! Between the kids and the garden I think that I will be learning for a very long time!!! The realization that the cold weather is coming can not be denied anymore. I contacted the local apple orchard and placed my winter order. Next Wednesday, I will be picking up 6 bushels of apples. We are hoping that will get us through the winter, but with the way my family eats apple I honestly am just hoping it will get us to Valentine`s Day. During the winter we try and not use the furnance except to take the chill off in the morning, so that I will get out of bed. I am not a morning person, especially in the winter. This week temps are suppose to be in the 20`s so it will be a good way to guage how much wood we are going to use a week. Christmas is coming soon and I would like to give as many homemade presents as I can. In the past I have done a gift or two for my husband and kids, but this year I would really like to do more. I am excited but I am worried it is going to be a difficult year to try this. My Lyme Disease has returned and my hands are not as strong as they once were. I am hoping that as I take the medication my strength will come back. No matter what we do, we will try and keep Christmas as simple as possible. We are focusing on spending quality time with family. Around the farm things are also getting ready for winter. We are done breeding rabbits for the year and will start breeding them again the first of Feburary. Last year we lost two litters to the cold and we do not want to ever do that again. The chickens are finishing up their molt, and growing in nice down feathers to keep them warm this winter. Their egg production is down, which is to be expected and it will probably stay down because of the cold weather we are getting. In the aquaponics system, we have moved the some fish around. The tilapia are now in our dining room in a 55 gallon tank. They are growing and seem to be happy there at last count we think that we have between 45 and 50. In the greenhouse, we have put the gold fish from the garden pond into the aquaponics system. I hope I am not speaking too soon, but they seem to be doing great! This is wonderful, but it still does not explain why the tilapia were dying in the system. We have asked a fellow tilapia person to come out and help us, we are hoping they come in the next week or so. Well, the fire place is roaring, my tea is steeping and my favorite radio program is coming on, so I am going to find my crochet hook and relax. I hope everyone had a good weekend!